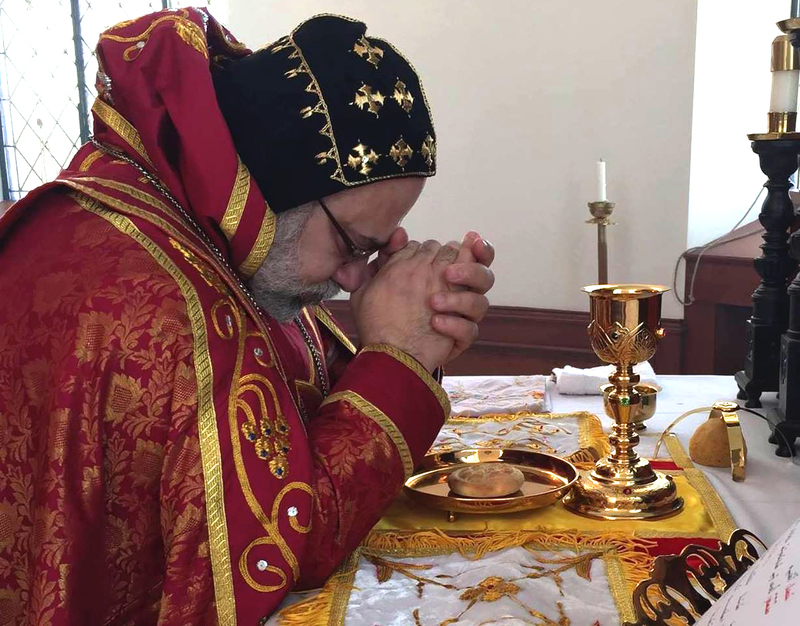 We offer apostolic benediction, prayer, and greetings in the Lord to our brethren, their Eminencies the Metropolitans, our spiritual children the venerable priests, monks, nuns, deacons, deaconesses, and our blessed Syrian Orthodox people. May the divine providence embrace them through the prayers of the Virgin Mary the Mother of God and St. Peter the head of the apostles, and the rest of the Martyrs and Saints. Amen. The Lord Jesus said, “Come to me, all you who are weary and burdened, and I will give you rest” (Matthew 11:18). In the hardship of life in this world and its pitch-darkness, to which man came after his fall into the sin of arrogance, and his separation from heaven and dismissal from Paradise to the land of misery, humanity in its entirety wandered aimlessly in the dark night. It was burdened under the yoke of the accursed Devil, as St. Paul says, “For all have sinned and are short of the glory of God” (Romans 3:23). Mankind became badly in need of God of glory, the Savior Whom God the Father promised to send in order to reconcile heaven with earth and make peace between the Creator of heaven and earth and man, the highest among His creation. In this connection, St. Paul the Apostle says, “But the fullness of the time was come, God sent forth His Son Who, born of a woman, became subject to the law, to redeem them who were under the law, that we might receive the adoption of sons” (Galatians 4: 4,5), “For we do not have a High Priest Who cannot sympathize with our weakness, but was in all points tempted as we are, yet without sin” (Hebrews 4:15). Yes, the Lord Jesus sensed practically, during His public divine dispensation in flesh, the misery of Mankind and their suffering in their bitter clash with their bitter enemy the Devil, who always tries to enter them into severe temptation. St. Peter, the head of the apostles, warns us against him saying, “Be sober, be vigilant; because your adversary the Devil walks about like a roaming lion, seeking whom he may devour. Resist him, steadfast in the faith, knowing that the same sufferings are experienced by your brotherhood in the world.” (1 Peter 5:8,9). How often the Devil and his hosts used natural factors to destroy the souls of man! How much severe pain, violent suffering, distresses, and severe hardships he caused to them! How many of them he deceived and thus they left the house of the Heavenly Father just as the prodigal son did. They squandered the graces that were showered upon them and wallowed in sin in strange land, and consequently anxiety, worry, despair, and pangs of remorse ruled over them because they separated from God. In this connection prophet Isaiah tells people like those, “Behold, the Lord’s hand is not shortened that it cannot save; nor His ear heavy, that it cannot hear. But your iniquities have separated you from your God; and your sins have hidden his face from you, so that He will not hear.” (Isaiah 59: 1,2). God spoke to the fathers throughout the ages and generations through prophets, and brought through them to humanity laws and codes and passed ordinances so that they might be close to God. But some of those who were entrusted with the task of preservation of the laws and teaching them to humanity added to these laws their own human commandments that were hard to observe. The Lord Jesus therefore, scolded them saying, “Woe to you also, you lawyers! For you load men with burdens hard to bear, and you yourselves do not touch the burdens with one of your fingers” (Luke 11:46). Accordingly, the Lord Jesus called all men burdened with hardships of life to follow Him, so that they may find full rest in flesh and spirit. He said, “Come to me, all you who labor and are heavy laden, and I will give you rest. Take my yoke upon you and learn from me, for I am gentle and lowly in heart, and you will find rest for your souls” (Matthew 11:28-30). Yes, in all the stages of our life on earth as individuals and as groups we enter into severe and different temptations, and face very many hard obstacles. It is not easy to break through these obstacles by ourselves unless we answer the call of the Savior, our Lord Jesus Christ. He is calling us to follow Him and carry His pleasant and light yoke, which is the cross of sacrifice and self-denial. In this way we will be liberated from the heavy yoke of the Devil, taking Jesus as an example, learning from Him meekness and humbleness so that we may gain from him real comfort and happiness in both worlds. In this crooked generation of ours, and in the hardship of our life as individuals or groups, we, who have received the grace of Holy Baptism in the name of Jesus, often look like His righteous disciples and become worried when we are faced with misfortune and hardships. We forget that the ship will never sink as long as the Lord is on board. The holy church of the Lord resembles a ship in the high seas; it will never shake no matter how small it is, and no matter how much it is tossed about by furious winds. But when we distance ourselves from the Lord, and the Lord stands away from us and from our ship, then we will sense the danger because the Devil then would roar like a wild beast wanting to swallow us. Let us then, our dearly beloved, be with the Lord always in word and in deed so that we may receive from Him divine power and feel that His divine providence embraces us, and His tending eye looking at us. He saves us from hardship and distress that we may not become shaken no matter how fierce the battle with the Devil and his hosts of devils and men is. We have to remain steadfast and firm in our strong faith. Christ is with us and He promised us saying, “For wherever two or three are gathered in my name, I am there among them” (Matthew 18:20). Therefore, He never neglects us nor He abandons us; rather he is “Emanuel”, God is with us. He will not take His Holy Spirit away from us. Even though God sometimes allows the Devil to enter us into the trial of temptation, but He does not allow him to destroy us. In this regard, St. Paul the Apostle says, “But God is faithful, and He will not let you be tempted beyond your strength, but with the temptation will also provide the way of escape, that you may be able to endure it” (I Corinthians 10:13). Dearly beloved: in the present hard circumstances that our world is going through today, when violence, injustice and tyranny is widespread, and most people have distanced themselves from God, let us answer the call of our Lord Jesus Christ and turn to Him. Let us recite the prayer of one of the righteous in his intimate discourse with Jesus as he says, “I have believed in you Lord, strengthen my faith. I have trusted you, strengthen my trust.” Let us say with the composer of the Psalms, “The Lord is my shepherd; I shall not want….He restores my soul. He leads me in the paths of righteousness for His name’s sake. Yea, though I walk through the valley of the shadow of death. I will fear no evil; for you are with me; your rod and your staff they comfort me.” (Psalm 23:1-4). Let us seize the opportunity of the arrival of the blessed Lent and couple our fast with prayer, earnest repentance, and almsgiving. Let us ask the Lord to spread His peace and security over all regions of the globe, and enter us not into temptations, but deliver us from the evil one. May God accept your fast, prayers, and alms, dear faithful, and make you worthy to joyfully and happily celebrate the feast of His resurrection from the dead. May the grace be with you. On the seventeenth day of the month of February, in the year two thousand and three, which is the 23rd year of our Patriarchal reign.